Are you looking to improve employee productivity in your organization? If so, you’ve probably done a lot of research and realized that this performance management consideration is a dynamic field. With every day that goes by, there appear new and exciting studies which necessitate a shift in our thinking or workplace processes. Whatever changes we can make to our companies, big or small, are worth it when we consider the impact such alterations can have on the overall performance of a business. There are certain methods of improving productivity that have gathered a lot of media attention, such as regular one-on-one performance discussions and the introduction of HR tech. But there are also other, more quirky, less well-known methods of boosting performance that are deserving of our attention, the introduction of which could seriously benefit your employees. Below are five unusual, but effective means of improving and sustaining productivity levels in your organization. According to one study, seating plans in an office can have a serious impact on employee performance. The evidence suggests that depending on who your workplace neighbor is, their effect can be either positive or negative. The study showed that roughly 10% of an employee’s performance “spills over” to those next to them. So if you were to sit an average employee next to someone who is twice as productive, their performance is likely to improve. Importantly, the more productive employee also benefits. This works because the “average” worker will usually try their best to improve and match the quality of the productive worker, while the productive worker strives to improve further. So rather than seating all your top performers in the same area, it is worth mixing things up and placing people with varying strengths and weaknesses next to each other. New research has revealed that the quality of the office air can have a serious impact on our health, mental processing and productivity. The study, carried out by Harvard and Syracuse University, experimented with varying levels of ventilation, carbon dioxide, and other emissions from common office products. The results showed that offices with reduced levels of carbon dioxide improved cognitive ability by 61%, while doubling the ventilation in an office increased cognitive performance by more than 100%. It seems that adding a bit of greenery to your office can improve productivity and employee satisfaction further. 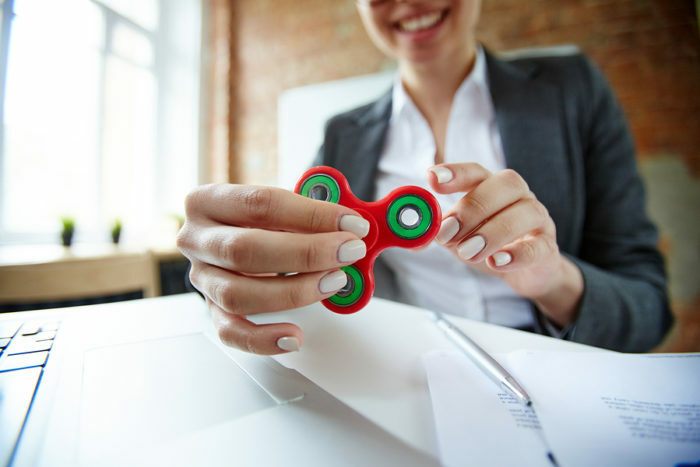 We were all told to control ourselves and stay still whenever we fidgeted as children, but studies are now suggesting that fidgeting might actually improve productivity. Research indicates that when we use our hands, particularly when we write, the results are increased memory and creativity. Even random doodling can help improve employee attention and memory. A BBC report of a 2005 study said researchers found that children who were permitted to fidget in class actually learned at a faster rate than those who were told not to. Since then, we have seen the introduction of innovative new fidget toys that help people’s minds from wandering. Research has also come to light that suggests minor distractions give the mind a temporary break, therefore refreshing the individual and improving overall productivity. If you’re designing the look of your new workspace, remember that colors affect human beings more than we often realize. Research into color psychology indicates that gray, beige and white offices tend to depress employees, especially women. Male employees are generally brought down by purple and orange environments. Low-wavelength colors, however, tend to boost focus and efficiency, so painting your walls pale blue or a calm green could result in improved morale. On top of this, yellow tends to evoke feelings of energy and optimism, which is thought to trigger innovation. Human beings are diurnal creatures. We are naturally more energetic during the day, and we need to feel the benefits that sunshine provides. Being exposed to daylight can do wonders for us. In fact, it has been proved that there is a direct neurological correlation between daylight exposure and quality of sleep. And let’s not forget: good sleep can seriously improve job performance. A lack of sunlight can also result in Vitamin D deficiency, Seasonal Affective Disorder (SAD) and our immune systems, which would result in greater levels of absenteeism. For these reasons, it’s beneficial to ensure your offices receive a plentiful amount of natural light, and to encourage employees to go outside and enjoy their lunch breaks when possible. There are plenty more methods to improve overall employee performance, some of which will be easier to implement than others. Whichever you decide to implement, remember that it is important to care for the mental wellbeing and motivation of your workforce, and that investing in their employee experience now will benefit your organization later.